Biracial Kids Destined for Doom? There’s a conversation going on in one of my groups about how biracial children will have a life of hardship…just because their biracial…or more specific because they’re half black. Mind you this is a group for African American parents who want to adopt Asian children. If you know me you know I am livid right now. LIVID. Normally the green She-Hulk in me would have come out and given them a serious piece of my mind but so far I have not made any comments to anything they wrote. Why? These women won’t “get” anything I have to say. While I adore them from sharing info with me back and forth thru the years…when it comes to this I think they need to stay on their side of the parenting fence. 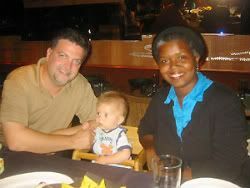 They are adopter's of monoracial children NOT parents of biracial children adopted or natural. How can they comment about the quality of life my son and children like him will have?! Why does being a half black child to a single mom means you have auto strikes against you?! Do you see me ranting about how their adoptive children will have issues because they’re monracial Asian and with African American families? There could be something said about some serious identity issues but I would never say that. How the heck would I know?! I just don’t understand the belief that anything outside the norm of mono-racial is destined for a life of doom and hardship. Where does this way of thinking come from?! 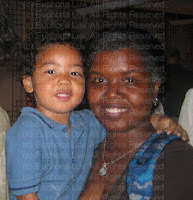 More important what does it say that the President of the United States is a biracial child from a single mother? His life story certainly didn’t end up tragic so come on people! Ok, so yeah I'm a bad mom for taking a photo before taking him out. But I wanted proof that Daniel can really get into some of the oddest kind of trouble. I can't tell you how many times I have to run after him to the rescue because his very inquisitive personality got him into trouble somewhere. Keeping up with him is an all day process. Now let me tell you how he ended up falling into the box! Since he discovered he can climb, sit or stand on something...he's always doing one of the three is not all. 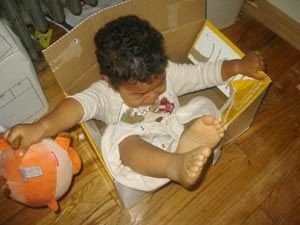 I guess he was trying to sit on the box when he slid in. Since the box is open...I took out all the diapers already...the top just crumbled under his weight. If you've ever held Daniel you'd know he's a solid kid so yeah...he slid right in. 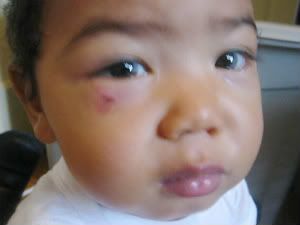 So after I took him out and checked him for any new boo boos, I had a really good laugh. Sometime you just have to enjoy the odd and funny things your child gets themselves into. The night before the Huggies Live Auction for KaBoom event I attended a dinner for all the parents invited to the event. 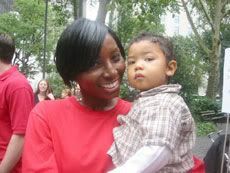 When I arrived to meet the group I was a bit surprised to be the only minority mom with a biracial child. As I met the parents I realized none of them would know who I was. 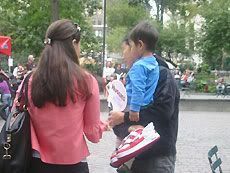 These were a different set of blogging parents then the usual group I see at events. At dinner I tried to form an open dialogue to get to know the parents and their blogs and hopefully share about my blog. Hmm. Didn’t quite go the way I hoped. But one parent was brave enough to tackle the unknown that I seemed to represent. LOL. The ironic thing is that one of my goals in blogging is to include the "white" community, to spread awareness to them so they can see the world is full of many different diverse communities. I’m trying to be inclusive and bring them into the racial conversation as a supporting factor not the main ideal society has placed upon them. Sometimes I find white people think their way and their lifestyle is the only one and their shell shocked when they encounter something contrary to their belief. Poor Bill expressed a thought very close to this. I have to give him credit for being honest with me about his feeling. Hopefully meeting me and Daniel has helped expand his awareness. We then sat down with Angie and each took turns sharing a little about ourselves and our blogs. 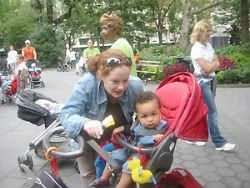 When my turn came I was a bit nervous since unlike the other parents I was the only minority mom with a biracial child. 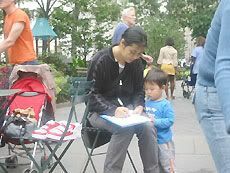 But I took a deep breathe and proudly explained that my blog is about raising awareness about moms of biracial children and the asian and black community. I expected our meet and greet to end there but Angie actually asked me some questions and a dialogue was started. I was so impressed that she was interested enough to explore what kind of reactions do I get as a mom of a biracial and how I deal with things. Another chance to spread awareness came during the event when I saw a white mom with her half black biracial kids. She had a son close to Daniels age and since they we’re playing in the same area we started chatting. I asked her if there was any mom of biracial play groups in the area. She said so far she’s only met another mom of biracial. Seems most play groups are monoracial moms and kids. We both expressed frustration with having to deal with strange looks and the famous “Is that your baby” question. I told her we should meet and start one. So we exchange numbers and will plan a playdate. Spreading awareness of blasian biracial children and the Asian Black communities isn't easy sometimes but when I have moments like these...it was very encouraging. Seems Daniel really impressed some people with his playing skills at our last KaBoom event. We were invited by Huggies to attend a live auction to celebrate the launch of Huggies Little Mover Diapers and to raise money for the organization KaBOOM! At the kick off event, celebrity mom Angie Harmon would hosted a live auction. The auction featured the Big Movers Shoes – designed for parents on the chase – which were signed by Angie and other celebrities. As Angie signed the shoes the kids would play in the Huggies Little Movers Adventure Zone. 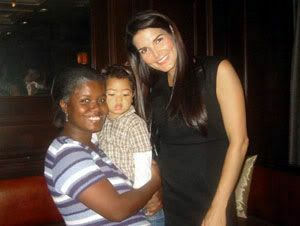 The morning of the event Daniel and I, along with other parents invited, had a meet and greet with Angie Harmon. We all sat down with Angie and each took turns sharing a little about ourselves and our blogs. Angie and I had an interesting convo about me being a mom of a blasian child. She was super sweet and really tried to connect with all the kids and their parents. When we arrived at the Adventure Zone Daniel of course was ready to go. 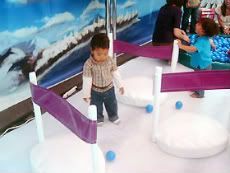 He excitedly explored the mock mountains, ski slopes, bridges and ball pit. 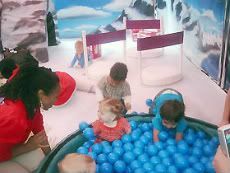 He even took some time out to flirt with one of the moms by the ball pit. I tried my best to keep up with him but he just kept going and going and going. But we soon had to break from playing to catch the action at the live auction. We watched as Angie signed the shoes and opened the auction for bidding. The bidding started off with a bang and went really fast. Before you know it winners were declared and shoes were being given to auction winners. I was vastly amused that one of the winners was an Asian mom. I made sure to take a photo of that! After the auction it was time to say bye to the other parents and kids. Daniel sadly was tired from having such a long and active day and started to meltdown. A quick round of nursing ...yup I nursed him publicly in the park but I covered with a blanket…calmed him enough for us to pack up and head home. 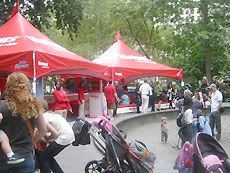 Even though the live auction in Madison Square Park has ended, there is still more auctions going on for other Big Movers Shoes signed by other celebrity parents like Tori Spelling, Jenny McCarthy, Chris O'Donnell , LL Cool J, Peter Facinelli and so many more. Check out HuggiesBigMovers auctions on eBay to bid and get yourself a pair. Recently I had a melt down after learning that my son injured himself. No matter how much you come to expect that injuries will happen...they always seems to drop kick you in the gut. I was on my way back from a blog event and decided to call the sitter to let her know I might be a few minutes late. 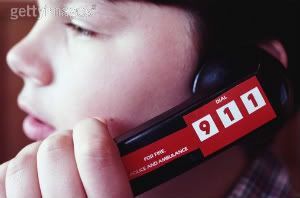 The sitter in a very calm voice said she was trying to reach me to tell me that my son had tripped and fallen on a toy. The toy he fell on injured right under his eye. As I listened to her I felt like someone stung me with a taser. I was numb all over. I felt so awful that my son was injured and crying while I was chatting and laughing with my blog friends. 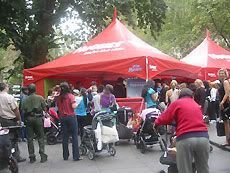 To make matters worse the event was child friendly and I could have brought him. The other moms brought their kids and the feeling of guilt and shame started to engulf me. As I rushed over to the sitter thoughts filled me head. These are the reasons I need to stay at home with my son my heart said. This wouldn't have happened if I would have stayed home or taken him with me. My son is probably now blinded due to this injury. I'm a terrible mother! 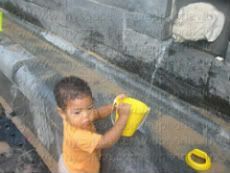 When I arrived the sitter explained everything to me and assured me that Daniel is otherwise alright. As I looked at the gash under his eye my feelings of guilt doubled up. I started nursing him for comfort...mine as well as his...as I went back over the story with the sitter checking each fact to be sure it was an accident. On the way home I tried to think straight but all I wanted to do is get my son home where I can keep him safe behind closed doors. I held him close all night as I tried to decided what to do about the work issue. The next day I sent him off to daycare, took myself to work and once in called my son's doctor office. I explained what happened and asked do I need to go to the emergency room. I worried that internal damage might have been done even thought I saw no bleeding or swelling. The nurse felt if I was that worried to come in to their urgent care section in the evening. So after work I rushed over to the urgent care center to sit and wait, and wait and wait. While I was doing all this waiting my son decided to "explore" the center. As I watched he started to flirt with the women sitting in the center. Giving smiles and cute looks. Then his exploring led to a game of catch with the security guard. At a certain point my mind said to my heart...lets go home, we'll make an appt and have his doctor look at him. Don't sit here late at night just for them to tell you what you can see. So far he's ok and recovering from the injury. While my son seems to be recovering from his injury I'm still hurt over it. Each day I try to think of ways I can stay home with him and still provide financially for us. I like my job but home with my son is where I want to be. 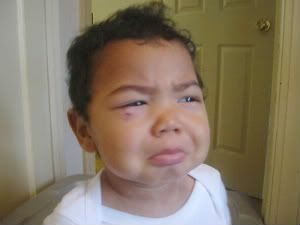 I know I can't prevent the boo boo's from happening but I want to be there when they do. I know, I know I've been bad. It's never my intention to go MIA but it happens time to time. But to be fair I did start a new job and had to learn how to cope with being with adults talking about clients, presentations and all that adult work stuff. Ironically what I wanted was to be with my son playing in the park. Sadly there is no pre-return to work course on adjusting to this change. Seriously someone should start one! Anyway, do you remember the Where's Waldo series? Gosh I loved those books. Did you know on the website you can design your own waldo like avatar? Of course for the sake of this blog I took time out to make one of me. Ha, ha. Isn't she hot and stylish with her camera?! So now let play a game of "Where's Nikki"....or more importantly "What is Nikki Doing" because while I have been neglecting my blog I haven't been doing nothing. I started working (duh) and had to learn to juggle drama with finding the right type if childcare for my son. There's so many blogs sitting in draft about my childcare issues it's not funny. I'm actually surprised that no one has spoke about the need to chose the right style of childcare. I'm starting new projects for myself and the asian black community... separately. As things develop in my mommy life I'm finding the community isn't the focus point it use to be. While I'm still passionate about the issue facing my community it's time I started separating in some areas so other's can be challenged to step up and contribute. Being a mom is my community focus now. I was invited to attended alot of blog events. Now I'm working on bunches of reviews and giveaways for my mom readers. With the holiday season fast approaching I want to find gift ideas that work for us. What does that mean? I'm excited to share gifts that can be personalized! I'm not talking about initials or basic things like that....I'm talking names, photos, and get this...skin tone! Yup, direct representation of what MY community of moms, children and families look like. What's a new mom to do? LOL. For the most part I think we need to find the humor in these "discovery" moments. While for me these things seem a bit odd ...for my son it's all new and undiscovered. The other side of the coin is that along with these eww moments I have the aww moments. 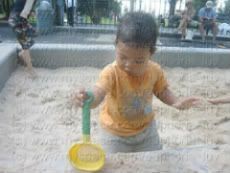 Recently we had a playdate in a park with a large sand box. The other kids jumped right in and started shoveling, building and making designs. Daniel just stood there and watched them like they were crazy. I thought maybe he just need to get in there and then he'll also start playing. Yet after putting him inside he just stood there. So I waited. He just kept standing and waiting for me to remove him. I just kept standing there waiting for him to play. Eventually I took him out but I was confused. 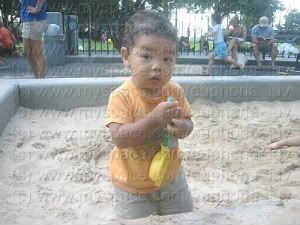 Why didn't he play in the sandbox? After a while of walking around with him and thinking about it, I decided maybe he needed my support IN the sandbox. So I walked him back, once again put him in and then joined him. I felt silly being the only parent in there but hey, my son needed me!